We’re due another batch of constituency polls this week from Lord Ashcroft. He hasn’t said precisely which seats he’s surveyed, or even when he’ll be releasing his data. All we know is that he’s revisiting some of the key Conservative-Labour battlegrounds, many of which he’s polled before, and which have previously shown Labour leads pretty much across the board. The national opinion polls have narrowed since then, however, so it’ll be fascinating to see how many Tory marginals are still leaning towards Labour or whether a few are showing signs of staying in the Conservative column. 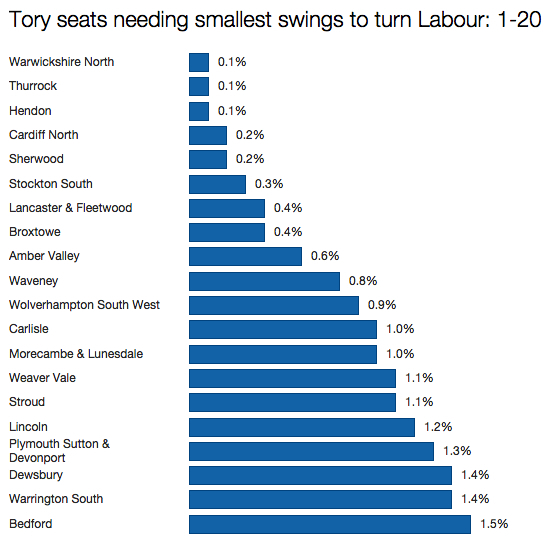 Arithmetically, these 20 seats represent Labour’s easiest chances of Tory gains. In reality, the party probably won’t do a complete clean sweep. I’ve long thought that Thurrock would stay in Conservative hands, and more recently identified it as possibly falling to Ukip. Even so, if Ashcroft shows any of these staying with the Tories, Labour will be very worried. These are the kind of seats the party absolutely has to win if it has any hope of ending up the largest party in the next parliament. 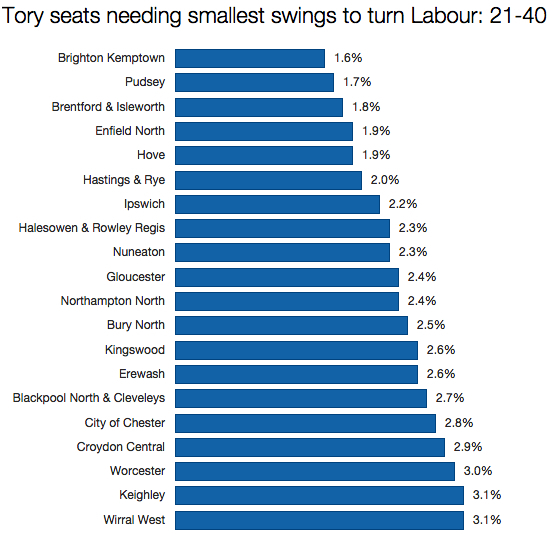 I’ll be looking out for polls in places like Brighton Kempton and Hove, where increased support for the Greens may be splitting the Labour vote and letting the Tories cling on. Worcester is another benchmark seat. Lord Ashcroft found Labour two points ahead here in October 2014. And look which seat is at the bottom of my list of 40: our old friend Wirral West, where Ashcroft found Labour just one point ahead in October 2014, and which I’ve already branded as the seat that will be the bellwether of Labour’s success. If the Tories have nosed back in front in anywhere up to half of the seats in this second list, it’ll suggest recent forecasts by the likes of the Guardian and May2015.com are on the mark: the Conservatives are now the favourites to be the largest party after the election, albeit some distance from having enough seats to form a majority government. Clearly GE2015 will be the most polled election in history and thanks to Lord Ashcroft the first general election with such an abundance of constituency polling. Will there be a more comprehensive analysis of seats in England? In particular, does Labour’s structural advantage in England – the one that enabled it to win 90 more seats than the Tories in 2005 despite losing the popular vote – still exist?